Etoloakarnania, Messologi, Agrinio, Nafpaktos, Aitoliko, Central Greece, Διαμονή, Διασκέδαση, Φαγητό. Occupying the western portion of Central Greece, the prefecture of Etoloakarnania combines the beauty of both the sea and the mountains. The capital of the prefecture is Messolongi (244 km from Athens), the sacred city of Greece. The heroic exodus of the "Free Besieged" was a bright spot in our modern history as well as a source of inspiration for poets such as Solomos and Byron as well as for other artists. 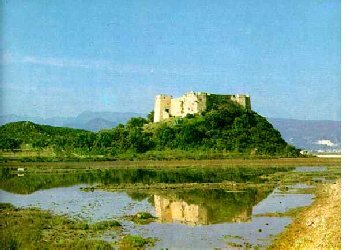 Messolongi, was founded in the 16th century on three islets at the mouth of the Aheloos and Evinos rivers, which were later united by silting to form three scenic lagoons. On entering the city you will see the Exodus gate and the "Garden of the Heroes". In the central squaqre, the Town Hall houses the picture gallery. If you 're a history buff, then you 'll want to visit Ancient Kalidon, Ancient Pleuron, "the castle of Kira Rhini", as the locals call it, and the Windmill, a Revolutionary monument. About 6 km. north of town, in a landscape filled with plane trees and running water, stands the historic monastery of Agios Simeon (17th c.). This is where 1,800 of the besieged sought refuge and were saved. Since that time, every year on Whitmonday, a lively folk festival takes place. The small island of Etoliko lies 13 km. northwest of Messolongi and is connected to the mainland by an arched stone bridge. From a distance its view is fascinating to the eye of the visitor. Some 50 km northwest of Messolongi the summer resort of Astakos, a picturesque market town, overlooks the gulf of the same name. Its extended unspoilt beaches with fine white sand and the sea of every shade of blue at Agios Yorgis, Asprogiali and Vela make the area prefrect for quiet, carefree holidays. Boats leave Astakos daily for Kefalonia and Ithaki. Another sight worth seeing in the region is the monastery of the Profitis llias (15th c.) near the village bearing the name of Karaiskakis, where the illustrious Revolutionary used to have his headquarters. Still following the coast, the road leads to Mitikas, a village built at the end of the gulf of the same name. From here you can find a little boat to take you across to Kalamos and Kastos, small islands with marvellous beaches. Just a hop from Mitikas are the interesing ruins of the ancient city of Alizea, and there is a very pretty beach at Paliomagaza. A few kilometres north of Mitikas you come to Paleros, a fishing village with another lovely beach. After Paleros the coastal road that winds up at Aktion loops inland before reaching Vonitsa, a pretty seaside and very green town at the entrance to the Amvrakikos gulf, built atop the foundations of ancient Anaktorion. At "Agios Petros" there are ruins of ancient temples and walls, while on the hill above a ruined medieval castle stands sentinel near the chapel of Divine Wisdom (12th c.) fashioned like a Byzantine fortress. Continuing west, 15 km. on the road one comes to Aktion, renowned in history as the site of the great naval battle between Octavian and Marc Antony. Here lies the famous “Channel of Cleopatra”, the area through which the fleet belonging to the celebrated queen of Egypt was anchored prior to its defeat at Aktion. Here can also be seen the ruins of a Venetian citadel and an archaeological site. East of Vonitsa, the road passes near Thirio, which has a fine archaeological museum, before reaching Amfilohia. The buildings of Amfilohia cover the slopes of two hills, providing a panoramic view towards the end of the gulf towards Arta. Amfilohian Argos lies 10 km. further north. Nearby beaches for bathing and fishing exist at Sparto, Ai Yorgi and Bouka, where the old monastery of Agios Nikolaos is located. Further north, at Menidi you can feast on all manner of seafood at its waterfront ouzeri and tavernas. South of Amfilohia, on the national road towards Agrinio, we suggest you make a little detour and go to Katouna, on the shores of lake Amvrakia to admire its fabulous view. Agrinio (35 km. north of Messolongi) is an important tobacco - producing centre with good facilities for tourists. The archaeological museum, the Papastratios Municipal Library, and the grove of Agios Christoforos on the hillside with a panoramic view, are some of the sights worth seeing in town. Other recommended stops include a visit to Angelokastro with its Byzantine monastery of the Pantocrator; the ruins of a 12th century Byzantine fortress at Melagi Hora (4 km NW); the Klissoura gorge with the monastery of Agia Eleoussa; and the enchanting landscape around the Aheloos dam. 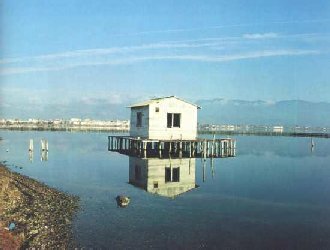 East of Agrinio, along lake Trihonida, you come to the village of Thermo, near the ruins of Ancient Thermo, where there is an interesting museum. 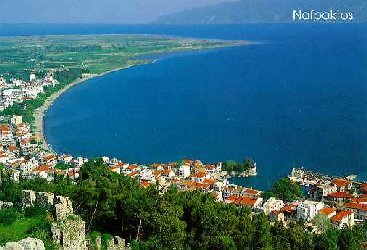 On the coast road that unites Phokida with Etoloakarnania you arrive at Nafpaktos, the prefecture's third largest town, famous for the battle that took place off its shores in 1571. This market town with its attractive Venetian castle and circular walled harbour will delight even the most demanding visitors. The well-preserved citadel, with its series of ramparts winding up to the top of the hill, is one of the most beautiful in Greece. All along this coast the sea is crystal clear. At Psani and Gribovo, where the plane trees grow down to the water's edge, the scenery is idyllic, while at Hiliadou (11 km. to the east) the shore is just right for swimming. The mountains near the town are the most thickly wooded with spruce and firs in all Greece; of a rare beauty, they are worth visiting in summer and winter alike. Platanos, known for its forest which contains dozens of species of trees, Arahova, Perkos, Dorvitsia, Simos, Ano Hora, Terpsithea, Elatou, Hrissovo and Ambelakiotissa - tiny villages in the woods 700 to 1000 metres above sea level - will beguile you with their primitive beauty. Terminal: 100 Kifissou Str. Messolongi, Etoliko, Amfilohia, Vonit-sa, Nafpaktos, Astakos, Mitikas. For information call the KTEL office 210/512.9292. From Thessaloniki : Nafpaktos, Antirion, Messolongi, Etoliko, one departure daily. Call the KTEL office in Thessaloniki, (2310) 521.518. Call Olympic Airways Athens, 210/966.6666, Olympic Airways Agrinion, (26410) 22.520. Athens-Aktion, Aktion-Agrinion, 96 km. ; Aktion-Messolongi, 120 km. For trips within the prefecture or connections between the larger towns in Etoloakarnania with other large towns outside the prefecture, call the KTEL office in Messolongi: (26310) 22.371; Agrinion: (26320) 22.227; Amfilohia: (26420) 22.225; Vonitsa (26430) 22.500; Nafpaktos: (26340) 27.224. Holidays in Greece, Car Rental Greece, Rent a Car Services.